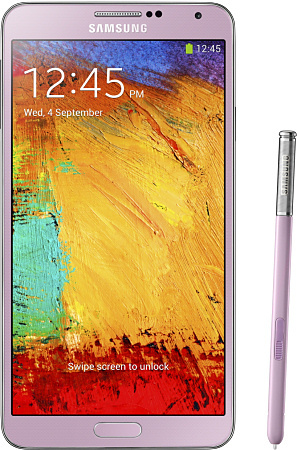 The Samsung Galaxy Note 3 is the third generation of this pioneering "phablet" device. As with previous generations the display is bigger than ever, but Samsung have managed the clever trick of making it a bit smaller and lighter at the same time. Perhaps the key thing that sets a Galaxy Note apart from a plain old Galaxy device is the inclusion of the "S Pen" which allows for more precise control of the device and helps with content creation (rather than just content browsing). This version of the S Pen has a new feature called "Air Command" which allows certain interactions with the Galaxy Note without touching it. The Galaxy Note 3 also features enhanced multitasking and a number of features imported from the Galaxy S4. The original Galaxy Note had a 5.3" 800 x 1280 pixel display and weighed 178 grams, the Galaxy Note II had a 5.5" 720 x 1280 pixel panel and weighed 180 grams. The Galaxy Note 3 has a 5.7" full HD 1080 x 1920 pixel panel and weighs just 168 grams. You can use the display with your finger (even when wearing a glove) as well as the S Pen. Even with a lighter weight, the Note 3 still manages to squeeze in a slightly larger battery 3200 mAh than the Note II. Samsung say that inside is either a 2.3GHz quad-core CPU (for the LTE version) or a 1.9GHz octa-core CPU (for the 3G version) although there's a chance that those specifications might change. There is a very healthy 3GB of RAM with either 32 or 64GB of flash memory plus a microSD slot. On the back is a 13 megapixel primary camera with a 2 megapixel one on the front. The camera can record full HD at up to 60 fps, ultra-HD at 30 fps or a slow-motion HD capture at 120 fps. All the usual Samsung camera features are here including (of all things) a "golf mode". 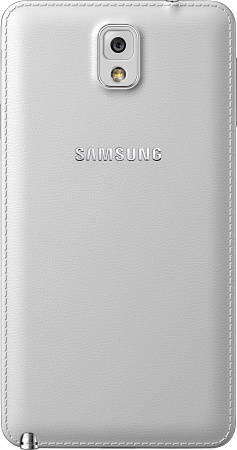 Samsung have managed to avoid the slabby look by doing something interesting - the back is a "soft touch" leather style material with stitching around the edges, available in black, white and pink with a range of after-market covers being available too. 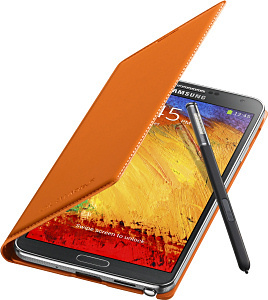 The edge of the Note 3 itself is serrated to give it a texture like a notebook. 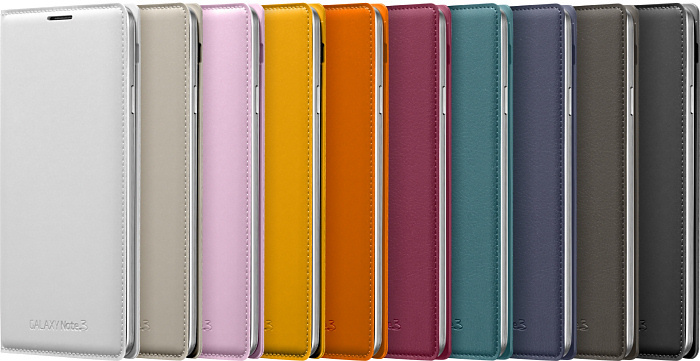 These interesting design touches certainly make the Galaxy Note 3 something more special. The Samsung Galaxy Note 3 has all the usual Android features plus a raft of sensors including a gesture sensor, humidity sensor, barometer and a hall sensor. The Note 3 also supports NFC and can be used an infra-red remote controller for your gadgets. The operating system on the Galaxy Note 3 is Android 4.3 with a whole load of clever Samsung enhancements, including Samsung Knox. Make no doubt that in terms of software and hardware features this is a high-end device and we would expect to see that reflected in the price. Samsung say that the Galaxy Note 3 will start to be available from late September onwards in 140 markets around the world with US carriers following later in the year.